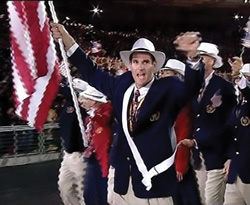 Pasadena — Two-time Olympian and Team USA Flag Bearer Cliff Meidl will be partnering with DigAlert at the Rose Parade 2018. Meidl, a member of the 1996 and 2000 USA Olympic Kayaking Team, is honored to have been selected to ride in the Rose Parade 2018 DigAlert (Underground Service Alert Southern California) “Call 811” Float, designed and built by Fiesta Floats. This will mark the second time Meidl participates in the Rose Parade following his appearance in 2015. The theme of this year’s Rose Parade is “Making a Difference,” in recognition of individuals in the community who work tirelessly for those in need, without accolades or reward. Fittingly, actor and life-long humanitarian Gary Sinise will be this year’s Grand Marshall. Cliff Meidl’s inspiring personal story contributes to his passion for working with DigAlert. While operating a jackhammer on a construction worksite when he was just 20 years old, he made contact with three live electrical cables that sent thousands of volts of electricity through his body and nearly took his life. Thankfully, fast-acting first responders were able to resuscitate Cliff after his heart failed. Over 15% of his body was burned due to the severe electrical shock — including serious exit wounds on his back and the back of his head; but most of the damage was done to his knees. The extreme electricity burned over one-third of the bone in both of his knee compartments. “When I finally regained consciousness in the hospital,” Meidl recalls, “I realized the extent of my injuries and wondered about the quality of life ahead.” Despite doctors’ recommendations of amputating both legs, Cliff’s parents fought and found Dr. Malcolm Lesavoy, a UCLA Reconstructive Plastic Surgeon, who saved Cliff’s legs with an innovative transplant procedure that re-built his knees by grafting muscle. After several years of intense rehabilitation, Cliff’s younger brother, Norman, introduced him to Outrigger canoeing and kayak paddling. He quickly fell in love with the sport and excelled through hard work and determination. Ten years after his unfortunate accident, Cliff realized his childhood dream of becoming an Olympian. 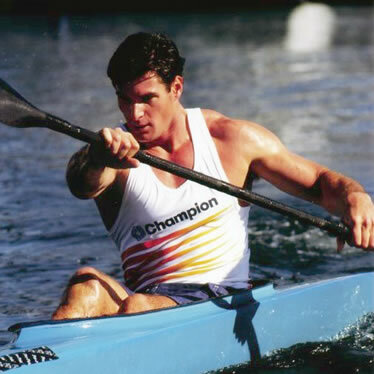 He made the USA Olympic Kayaking Team and competed in both the 1996 Atlanta Olympic Games and the 2000 Sydney Olympic Games. Cliff’s’ story is one of resilience and strength — not only did he beat the odds, he shattered them. Competing twice in the Olympic Games was a triumph and honor for Cliff. At the Sydney Olympic Games, Cliff was bestowed one of the highest honors as an Olympian — he was chosen to be Team USA Flag Bearer and lead the entire US delegation carrying the American flag into the Opening Ceremony. Since then, Meidl has served as a national media spokesperson in the construction Safety and Call 811 Before You Dig industries, including DigAlert. He uses his own experience as a messenger through motivational speaking to encourage workers to uphold the highest of safety standards at all times. His mission perfectly aligns with DigAlert’s goal to reduce damages and save lives by taking preventative measures whether on construction sites or at home in their communities. What better way to keep everyone safe than to raise awareness about such an invaluable organization at an event as exciting as The Rose Parade?